Sonric's brings you an original and delicious treat that will leave your tongue tingling with its sour and spicy flavor. 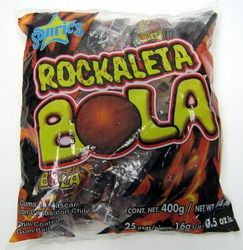 Rockaleta Bola are sweet and spicy multi-layered gum balls, that are quite similar to the Rockaleta lollipops. So if you love the lollipops, you will surely love this gum balls too. What are you waiting for? Try them already! Ingredients: sugar, spices, corn syrup, gum base, dextrose, seaiants, glycerine, citric acid and artificial flavors and colors. Sonric's te trae un dulce original y super delicioso que hara tu lengua vibrar con con sabor picoso y agridulce. Los Rockaleta Bola son chicles con multicapas de dulce y chile, muy similar a las paletas Rockaleta. Asi que si te encantan las paletas, estos chicles te fascinaran aun mas. Que esperas? Pruebalo ya! Ingredientes: azucar, condimento, jarabe de maiz, goma base, dextrosa, selladores, glicerina, acido citrico, saborizantes y colorantes artificiales. I got one of these once at the local mex grocer and it was pretty darn big. A lot larger than the normal pops found in some super markets. It's an odd candy but worth trying once. this lollipop is great. it has many layers to it. it's just tasty. (; !magnifico!